How electricity generated from water? There are two primary methods for generating electricity from water. One method uses the energy potential of trapped water in dams in a more sophisticated version of the water wheel, and the other captures energy from ocean waves. Electricity generated from water is entirely renewable, since water is ab abundant natural resource and no water is expended during the electricity generation process. For this reason, many nations rely heavily on hydroelectric power because they want to promote sustainable energy production. When a dam is used to generate energy, tunnels are installed in the dam when it is built. These tunnels are lined with turbines which are turned when water flows through the tunnels. As the turbines turn, they create electricity which can be fed into the grid or stored. Dam operators can determine the amount of energy produced by regulating the flow of water; most dams are capable of generating far more power than they do on a daily basis, which can be useful when there are problems at other power plants and facilities. Electricity generated from water on the ocean is known as wave power or wave energy. This method of power generation uses changes in the air levels of sealed chambers to power turbines. These chambers are floated on parts of the ocean with high wave activity, ensuring that a great deal of electric energy can be produced. Not all areas of the ocean are suitable for the generation of wave power, but some seaside communities have taken advantage of the technology to power themselves. Electricity generation is a major concern for much of the world, since demand is only rising with the growing human population. The benefit of electricity generated from water is that once generation facilities are built, it is easy to maintain and operate them. Electricity generated from water is also clean, since it doesn't involve the burning of fossil fuels to generate power. People can also generate hydroelectric power themselves, if they have access to a fast-moving body of water so that they can install waterwheels. There are some drawbacks to electricity generated from water. Dams, for example, can be quite destructive when they are installed, as water will flood the regions behind dams. This has been a cause for controversy in the past, especially when dams flood valleys used by native peoples for burial and religious ceremonies. 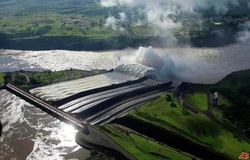 If a dam fails, it also cause catastrophic flooding, and people downstream of a dam tend to experience a reduction in available water after it has been installed. Concerns have also been raised about wave power, since it can be quite noisy and it may prove damaging to marine life.